Moments like this should be cherished, not downgraded. They should be celebrated, not discredited. Playing in the Europa League should be considered a privilege, not a regret. As Burnley's European tour came to an end at Turf Moor, with Olympiakos advancing to the group stages, the quarrel surrounding priorities and dilemmas ensued. It's been 51 years since the club played in the European Fairs Cup. It might be another half-a-century until fans are able to basque in the splendour of this competition again. It's skipped a generation or two once before. It will probably do it again. It may not even happen. So why have we not been completely sold on this experience? What can we strive for as a football club if we can't completely enjoy the fruits of our labour? Where do we go next if we can't embrace European football? Three games without a win in the Premier League and a ludicrously premature debate had already been sparked. Did the Clarets really need to forfeit their involvement in the Europa League to concentrate on the domestic programme? That was the rhetoric voiced by some concerned supporters as the club sat in the bottom three following defeat to Fulham. This, though, was a night to be proud. It was one to remember. In the end the hosts didn't quite have enough to bypass the 44-time Greek champions. They were close, but there was no cigar. It was just one of those nights. Sam Vokes twice teased the home crowd in the first half, threatening after Daniel Podence had dragged his shot wide from a quick counter. Many were on their feet when the Welshman got ahead of Andreas Gianniotis to meet Dwight McNeil's cross but his header flew wide of the near post. Jeff Hendrick saw his volley blocked by Miguel Angel Guerrero from point blank range when Vokes guided McNeil's set-piece across goal and soon after the visitors survived another huge scare. Gianniotis was pulled out of position when McNeil's corner was flicked on to the back post but, with the goal gaping, Vokes steered his header over the crossbar. Podence hammered the ball in to the side-netting at the other end and scooped over the bar with his right foot after Kostas Tsimikas pulled the ball back from the byeline. But Burnley were better, brighter, showing their pedigree on the grandest of stages. A goal before half-time to couple their clean sheet would have been deserved. It just wouldn't come. 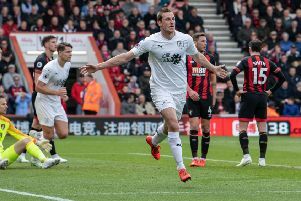 Vokes was in the clear when racing on to Ashley Westwood's ball over the top and his pass was turned goalwards by Ashley Barnes. However, the striker looked up in disbelief when his attempt, which had Gianniotis beaten, kissed the outside of the upright. And the home side's luck was out after the break. They did everything right, aside from putting the ball in the back of the net. Vokes's effort early on was as clean as they come. Perfectly weighted, and with subtle trajectory, the ball floated out of reach of Gianniotis and cannoned back off the post. McNeil - remember that name - almost capped a memorable first senior start with a goal but Gianniotis got a glove to the youngster's drive to turn it over the bar. Both Hendrick and Aaron Lennon failed to pick out the right pass from promising positions inside the area as the Clarets continued to apply the pressure. Unfortunately, Olympiakos needed just one shot on target to make it count after the break. That away goal came with seven minutes remaining, giving the home side little time to recover. Podence, a menace in both legs, turned his man inside the box and lifted the ball over Tom Heaton to make it 1-0 and 4-1 on aggregate. Burnley did get the goal they deserved with minutes remaining, only it was too little too late. Vokes's header from Charlie Taylor's corner was cleared off the line but substitute Matej Vydra was on hand to bundle the ball over the line on his debut. Dyche's men continued to press, attempting to achieve the impossible, but when Viktor Kassai blew his whistle to signal the end of the tie, he also blew full-time on Burnley's European tour. But what an adventure it's been!